Project Cargo is a specialize field of Freight Forwarding that requires immense expertise, experience and knowledge. The GTL team is well equipped and experienced to handle over size or heavy cargo and able to provide this specialize shipping service to expedite international movements of project cargo. Our Company has in-depth know how on which shipping line is best suited to your requirements; whether the consignment is to be shipped on a Flat Rack, break bulk vessel, or a roll-on-roll-off vessel. 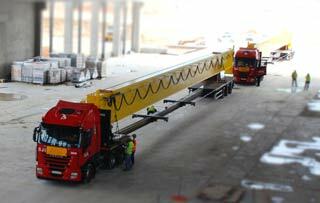 Our heavy lifts and heavy weight transport equipment will always make easy to transport site to port or port to site. We provide customer a range of options to select depend on their requirements such as Flat Racks, Flat Beds, Open Top containers, Break-bulk service, Ro-Ro service or General purpose containers. Project Cargo has less option of services, routes, transshipment points and greater requirement of lashing/packing than non heavy equipment shipments, so it is essential to partner with a Project Cargo specialist such as GTL..